Welcome to our web site. Boston Hill Farm is a small sheep and wool farm in central New Hampshire. We have a flock of Border Leicester and Cotswold sheep who produce lustrous wool highly prized by handspinners and felters. New additions include Shetland sheep. 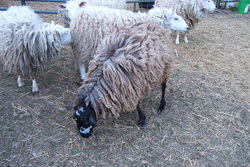 Our sheep have white or colored fleeces. Though we dye some of the yarn ourselves, we sell mostly naturally colored yarns, batts and roving. We knit hats, mittens, socks, and vests for sale at local farmers markets, wool festivals and craft fairs. In addition we needle felt various small figurines.